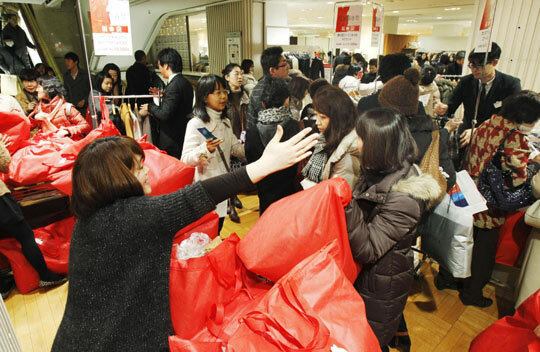 Major department stores in Japan kicked off their first business day of 2012 on Monday as crowds of shoppers lined up to gamble on so-called lucky bags filled with random discount goods and other New Year’s bargains. The charm of the mysterious fukubukuro lucky bags is that their contents are supposed to be worth more than the price. This year, many Japanese department stores prepared fukubukuro lucky bags filled with emergency goods and survival foods, as well as warm clothing for dealing with power-saving steps being taken at homes and offices in light of the March disasters. Mitsukoshi’s flagship store in Tokyo’s Nihonbashi district opened at 9:50 a.m., 10 minutes earlier than scheduled, after many people braved cold weather to line up in front of the store. 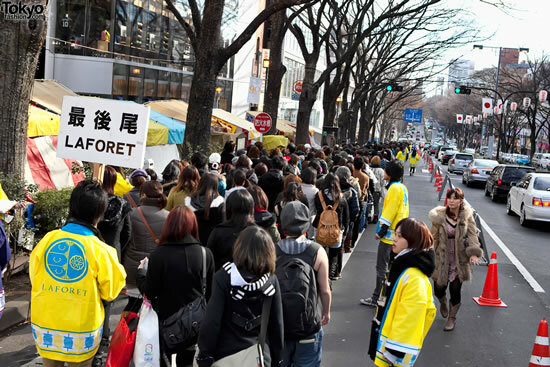 At the Matsuya department store, a line of some 6,700 people extended about two blocks. The sections inside the store had prepared 30,000 bags. Matsuya’s flagship store in Tokyo’s Ginza district offered luxury lucky bags costing ¥30,000 ($390) that were filled with winter clothing, including coats worth ¥200,000 ($2605). Rita’s Diary, a clothing outlet for women located on the second floor of the Matsuya department store had prepared 10 bags for ¥20,000 ($260) and 50 for ¥10,000($130). All 60 bags were gone in 81 seconds, according to the store.